InfoComm International, trade association representing the commercial audiovisual industry worldwide, has announced the summit program for InfoComm India, set for Sept. 12-14, 2016 at the Bombay Exhibition Centre, in Mumbai. 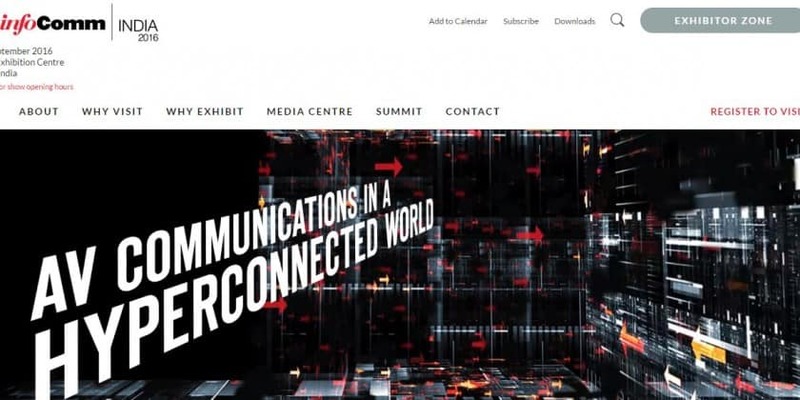 The InfoComm India Summit’s three days of sessions will focus on key issues in the pro-AV industry, with headlining speakers talking smart-city design and planning and cyber security. Dr. Uma Maheswaran, CEO of Surbana Jurong Consultants (South Asia and Middle East), will discuss the challenges India faces with its smart-city mission. Surbana Jurong Consultants has worked on consulting, design/build, and facilities management projects in 229 cities spanning 47 countries and completed 72 projects across 11 states in India. The firm is also involved in the master-planning of Andhra Pradesh’s New Capital City. Dr. Maheswaran’s session is a chance for attendees to learn how this development could potentially be a model for other smart cities. Dr. Madan Oberoi, Director for Cyber Innovation and Outreach at the INTERPOL Global Complex for Innovation in Singapore, will speak on the need for recalibrating the law enforcement strategy to counter evolving cyber threats. With digital and information technology playing an increasingly important role in business, India, host to some of the world’s biggest IT service companies, is seen as a growth frontier in a perilous online environment. India’s vulnerability to cybercrimes has attracted both the public and private sector to take a hard look at implementing policies, laws and learn from global best practices to keep “Digital India” safe and secured. Asia Pacific comprises 36.5 percent of the global professional audiovisual market, according to InfoComm’s 2014 Market Definition and Strategy Study. The World Bank is forecasting India’s economy to grow 7.5 percent in 2016. With increased growth in the years to follow, India’s economy is the peak of the world’s fastest-growing economies. During InfoComm India, attendees can visit the InfoComm booth for in-person, one-on-one professional development consultations. At the end of the consultation, participants will receive a tailored plan of training opportunities not only from InfoComm, but also from others sources inside and outside the AV industry, including courses devoted to information technology and networking, as well as business management. Many of the education sources that are part of InfoComm’s offering deliver free and low-cost training. InfoComm India Summit’s Headlining Speakers to Discuss Smart Cities, Cyber Security 0 out of 5 based on 0 ratings. 0 user reviews.